For decades, manufacturers, retailers and trade organisations have emphasised voluntary compliance of government food safety standards with a strong focus on product safety. 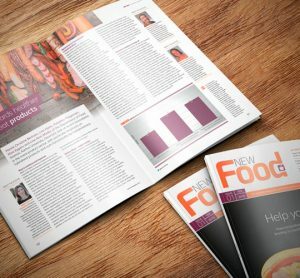 Today, global retailers and manufacturers are working to find common ground with schemes that focus on the quality and effectiveness of the underlying management systems involved in the production of food products. One question facing food processors today is how will they ensure that the chemical compounds, processing aids and products they procure globally, meet the demands of a robust food safety scheme? 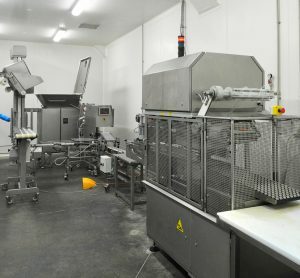 In this article, we consider this challenge as it relates specifically to food grade lubricants, an integral component of modern processing technology. For decades, manufacturers, retailers and trade organisations have emphasised voluntary compliance of government food safety standards with a strong focus on product safety. Today, global retailers and manufacturers are working to find common ground with schemes that focus on the quality and effectiveness of the underlying management systems involved in the production of food products.One question facing food processors today is how will they ensure that the chemical compounds, processing aids and products they procure globally, meet the demands of a robust food safety scheme? 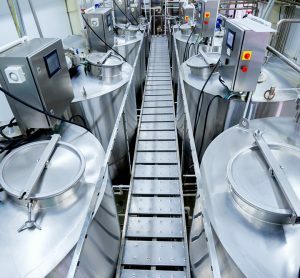 In this article, we consider this challenge as it relates specifically to food grade lubricants, an integral component of modern processing technology. There are two types of certifications to think about in the world of lubricant safety. The first is product certification. This is where the focus is on the lubricant product itself, including testing, inspection and verification to confirm product specific attributes. The other type of certification – offered under various programs such as ISO 22000 – is food safety system certification, which focuses on the quality of food safety systems. Both product and system certification approaches focus on improving the safety and quality of food grade lubricants and each draw on their unique strengths. Another way to consider this is to envision the two strands of a DNA helix. One strand is the product quality, essentially the verification of the product itself. The other strand is the food safety system. The ultimate best practice is to combine these approaches because they both provide the core building blocks for producing the safest, highest quality lubricant. As with real DNA, the strength comes from joining together two elements or ‘strands’ to provide structural strength and integrity. Let’s take a closer look at the first strand which is product certification. Independent, third-party lubricant product certification provides peace of mind to both food processors and consumers alike. Today, voluntary schemes such as NSF H1 Registration and ISO 21469 Certification exist to fulfil this need. 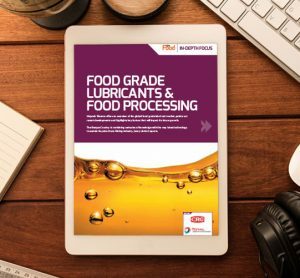 For more than 10 years, NSF International, an independent, non-governmental, notfor- profit organisation has managed a global Registration Program for evaluating food grade (i.e., H1) lubricants and other food processing compounds. A complete list of NSF Registered lubricants and other products can be found in the publicly available NSF WhiteBook™ (www.nsfwhitebook.org). In order to achieve NSF H1 Registration, the lubricant manufacturer must demonstrate that all lubricant ingredients meet requirements established by the U.S. Food and Drug Administration (FDA) in Title 21 of the U.S. Code of Federal Regulations (CFR), Section 178.3570, and in the NSF Nonfood Compounds Registration Guidelines. This ensures the lubricant meets strict health and safety requirements for applications where incidental contact with food might occur. Similarly, another product standard, ISO 21469, establishes strict hygiene requirements for the formulation, manufacture and use of lubricants which may come into contact with products such as food, pharmaceutical and cosmetics, during processing. The value of ISO 21469 product certification is that it provides added assurance that the lubricant formula is safe, the product is traceable and manufacturing and packaging activities are operated under safe, sanitary conditions. The requirements within the ISO 21469 are prescriptive and relate directly to the hygienic characteristics of the finished lubricant product. GFSI, the Global Food Safety Initiative1, has emanated from global retailers and inter – national manufacturers, with a key driver being the globalisation of food supply and increasingly long and complex supply chains. Global sourcing and distribution of food and beverages has increased the complexity and interconnection required to produce consistency and uniformity. Each of the schemes promotes systemisation and documentation that guide manufacturers to implement and manage an effective food quality and safety program focused on processes, measurement and documentation. These systems support manufacturing pro – cesses, as well as upstream and downstream supply chains that often span the globe. Ultimately, they are complex programs that require in-house experts to implement and create the documentation. The ISO 22000 Standard, ‘Food safety management systems – requirements for any organisation in the food chain’, was released in September 2005. ISO 22000 can be applied to any organisation involved in any aspect of the food chain that desires to implement systems that consistently provide safe products. For products such as food grade lubricants that are introduced into the food supply chain but are not actually food, ISO 22000 is the applicable food safety system certification scheme. There are many points of difference between the product certification versus system certification approach to quality. Product certification stand – ards such as NSF H1 and ISO 21469 are tailored specifically to the lubricant itself, and thus are naturally more prescriptive with specific criteria. In system certification guidance documents, there are references to industry practices, but no product specific requirements outlined. The differences are driven by the intrinsic nature of the two different approaches – one such as ‘H1’ tied to a specific product, the other such as ISO 22000 tied to systems generic to any manufacturer in the food supply chain. Ultimately, food processors must have choices in selecting food grade lubricants that offer the best of both worlds. Selecting lubricants that have been independently verified to meet prescriptive regulatory requirements for toxicology and labelling by achieving NSF H1 or ISO 21469 certification is a must. However, having the added assurance that the lubricant was manufactured under the over-arching umbrella of an effective food safety management system in compliance with ISO 22000 adds significant confidence in the product and value for the food processor. NSF International, The Public Health and Safety Company™, a not-for-profit, non-governmental organisation, is the world leader in standards development, product certification, education, and risk-management for public health and safety. NSF is widely recognised for its scientific and technical expertise in the health and environmental sciences. NSF has earned the Collaborating Center designations by the World Health Organisation (WHO) for Food and Water Safety and Indoor Environment. Serving manufacturers operating in 80 countries, the NSF Mark is recognised for its value in international trade around the world and is respected by regulatory agencies at the local, state, and federal levels. Sarah Krol is the Business Unit Manager for NSF’s Nonfood Compounds Registration, ISO 21469 Certification and Green Chemistry product evaluation programs. Ms. Krol has over eight years of diversified quality assurance and regulatory experience with emphasis in the food and pharmaceutical sectors. Her background includes experience in laboratory auditing, quality assurance, analytical testing, chemical R & D and validation. In her current role at NSF, she is responsible for chemical product evaluation and determining compliance to consensus standards and regulatory requirements, including: ISO standards, FDA, EPA and USDA requirements. What are Food-Grade Lubricants and why do we use them?